With its rugged mountains, pristine coastlines and tumultuous, melting pot history, the Mediterranean island of Sicily has much to offer visitors. As part of Italy, one can expect to find lots of delicious food and wine in addition to the more mundane tourist activities such as “The Godfather” sightseeing tours. But just how good is the local wine? In the 1990s, the restaurant scene here in the USA already included a large percentage of Italian restaurants, from casual chains to ultra-fine dining. Americans were eating, and drinking, huge quantities of Italian product. Sicily wanted to get on the gravy train, but knew the market was not receptive to indigenous/native grape varieties, so they started producing international varietals like Chardonnay and Cabernet Sauvignon, which we lapped up like thirsty kittens and cream. But things have changed. Today, with the second wave of wine bar popularity – the first was in the 1970s – and wine drinkers open to the unusual or esoteric, Sicilian producers have circled back to their roots, or the roots of their native vines I should say. The renaissance of three local red grapes, Frappato, Nerello Mascalese, and Nero d’Avola, and their rapid acceptance by sommeliers and wine merchants, is breathtaking. Frappato is the lightest of the three, and the most playful. Grown in the Southeast, in Vittoria, it produces delicate, ethereal reds with notes of cherry and earth. One of our favorites at Planet Grape Wine Review is the 2017 Donnafugata Bell’Assai Vittoria Frappato 91 points, 13.5%, 750 ml, $28, delicate, dry, earthy and tart with notes of cranberry, cherry, red rose, gingerbread, cedar and sandalwood. We also highly recommend the Frappato/Nero d’Avola blend 2015 Planeta Cerasuolo di Vittoria 92 points, 13%, 750 ml, $23.99, mid-weight, beautifully balanced and expressive with notes of orange zest, cherry, red licorice, carob, leather and white mushroom. Etna has enjoyed a lot of attention over the past ten years, as vineyards on the local volcanic slopes were brought back to life after a long dormancy to produce haunting, earthy wines from Nerello Mascalese, sometimes compared with Pinot Noir, which I agree with in structure only. These wines are light and tart but the flavor profile is uniquely Sicilian. The 2016 Donnafugata Sul Volcano Etna Rosso 91 points, 13.5%, 750 ml, $35, is lean, muscular, zesty and dry with notes of strawberry, cherry, brown mushroom, black olive and grilled sausage. Ancient and noble Nero d’Avola is the grape with the highest quality potential of Sicily, and is at home in Noto, between Siracusa and Ragusa on the island’s southeast tip. It is also known “Calabrese,” suggesting origins in Calabria on the mainland. It also may be, according to another theory, an ‘italianization’ of the ancient vernacular name of Nero d’Avola, being ‘Calaurisi,’ which literally means ‘coming from Avola’. This “black” grape of Avola, a wine-growing village in Southeastern Sicily, was added to many European wines to give added color and weight. Nero d’Avola wines are easy going if tart. They are delicious straight out of the gate, with fragrant, ripe black cherry, blueberry and violet notes. Judiciously oaked, the wines become softer, sleeker, and rounder. In general, the wines are described as vibrant and richly fruited with a firm core of acidity despite the warm origin. The more traditional styles age well. One of our Planet Grape Wine Review top picks is the 2015 Planeta Santa Cecilia Noto 93 points, 14%, 750 ml, $40.99, full, complex, racy and dry with notes of raspberry, fig, red and black licorice, cardamom, bay leaf and porcini dust. We also recommend the 2012 Planeta Nero d’Avola Noto 91 points, 13.5%, 750 ml, $28, light, tart and very dry with notes of wild strawberry, cherry preserve, dried herbs, roasted almond, cinnamon and sandalwood. The simpler 2016 Planeta Le Segreta Nero d’Avola 90 points, 13.5%, 750 ml, $15, is lean, dry, tart and fresh with notes of pomegranate, blackberry, mushroom and clove. 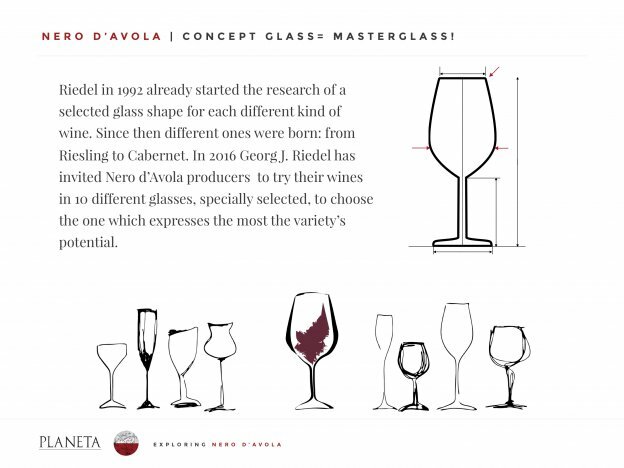 In 2016, Austrian glass manufacturer Georg Riedel invited a group of Nero d’Avola producers to design a custom glass showcasing their unique grape. The result is an lavishly sized goblet sloping up slightly from the stem and widening so much that one’s nose is nearly inside the chimney-shaped bowl. In a side by side comparison, our above recommended Nero d’Avola wines where much more open, fruit forward, and silkier in the special glass. 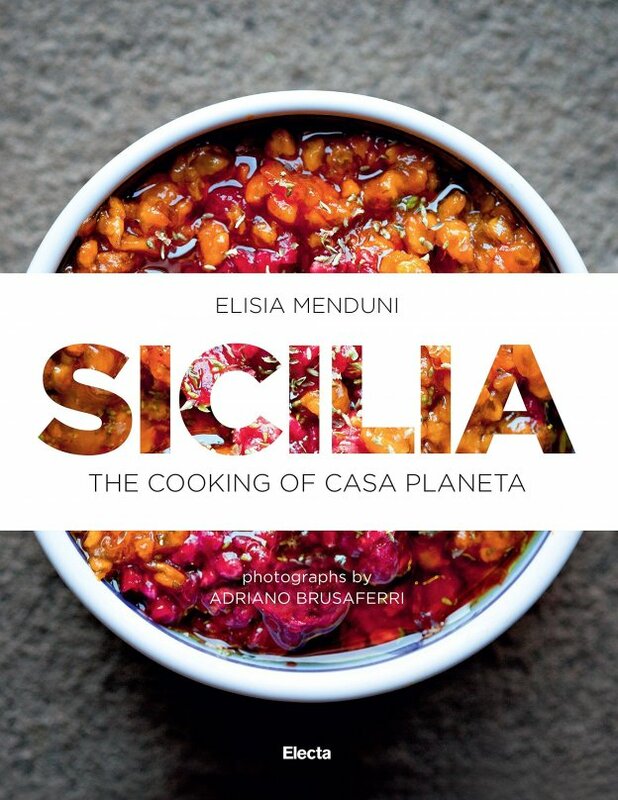 Elisia Menduni has created a mouthwatering, authentic collection of mostly easy to prepare Sicilian specialties to pair with your Sicilian Wines.